This article is about the 2014 American romantic comedy drama film directed by Rob Reiner. For other uses with similar titles, see So It Goes (disambiguation). And So It Goes is a 2014 American romantic comedy drama film directed by Rob Reiner and written by Mark Andrus. The film, which stars Michael Douglas, Diane Keaton and Sterling Jerins, was released on July 25, 2014. Oren Little (Douglas), a realtor by trade, develops self-absorption, turning his back on his neighbors and shunning the notion of kindness to others, after his wife dies; part of his self-absorption is having no patience for children, not even his own now-adult son, from whom he has been estranged. He has a next-door neighbor, Leah (Keaton), whose own husband has likewise died, never having had any children of her own, which leads her to throw her soul and her tears into reviving a singing career that had stagnated. Then, one day, Oren's estranged son suddenly leaves his father in charge of his own nine-year-old daughter Sarah (Sterling Jerins), a granddaughter whom Oren never knew existed. When Oren's estranged son drops Sarah off at his home, needing his father to take care of her, neither Oren nor Leah, each of whom are lonely souls, have any reason to suspect that Sarah's involvement with their lives would enable them to heal their emotional wounds. Filming began in June 2013 in Connecticut. Shooting also took place in California and Greater Manchester. On December 17, 2013, it was announced that Marc Shaiman had composed the music for the film. The first trailer for the film was released on May 9, 2014. And So It Goes received mostly negative reviews from critics. It currently holds a 18% rating on Rotten Tomatoes based on 83 reviews with the consensus: "And So It Goes aims for comedy, but with two talented actors stuck in a half-hearted effort from a once-mighty filmmaker, it ends in unintentional tragedy". Another review aggregator, Metacritic, which assigns a rating out of 100 top reviews from mainstream critics, calculated a score of 38 based on 31 reviews, indicating "generally unfavorable reviews". Film critic Leonard Maltin gave the film a positive review, saying "Director Rob Reiner's ′And So It Goes,′ offers more than juicy leading roles to stars Michael Douglas and Diane Keaton." Film critic Richard Corliss gave the film a negative review, saying "And So It Goes may touch the frayed heartstrings of some older viewers, but it's pretty bad - the failed attempt to Heimlich a venerable movie genre." ↑ "And So It Goes". Freestyle Releasing. 2014-07-25. Retrieved 2015-04-16. ↑ "And So It Goes - The Numbers". Retrieved May 25, 2015. ↑ "And So It Goes (2014) - Box Office Mojo". July 25, 2014. Retrieved November 12, 2014. ↑ "Production Begins on Rob Reiner's AND SO IT GOES… Starring Michael Douglas and Diane Keaton". collider.com. 11 June 2013. Retrieved 12 July 2013. ↑ "Michael Douglas wears a stained dress shirt and stern look on Connecticut set of new movie And So It Goes with Diane Keaton". dailymail.co.uk. 11 July 2013. Retrieved 12 July 2013. ↑ "Marc Shaiman Scoring Rob Reiner's 'And So It Goes'". filmmusicreporter.com. December 17, 2013. Retrieved July 21, 2014. ↑ McDaniel, Matt (9 May 2014). "'And So It Goes' Trailer: Michael Douglas and Diane Keaton Finally Unite". yahoo.com. Retrieved 10 May 2014. ↑ "And So It Goes". Rotten Tomatoes. Retrieved 2015-04-16. ↑ "And So It Goes Reviews". Metacritic. Retrieved 2015-04-16. ↑ Maltin, Leonard. "And So It Goes | Leonard Maltin". Blogs.indiewire.com. Retrieved 2015-04-16. ↑ Richard Corliss (2014-07-25). 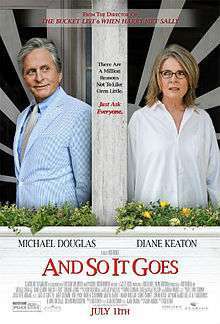 "And So It Goes Movie Review: Michael Douglas, Diane Keaton Team Up". Time.com. Retrieved 2015-04-16.